The Zohar: The Creator said: “Here are a united people,” since they were joined as one and will therefore succeed at anything they do. This is why the degrees were dispersed, each in a separate direction, and therefore all of these nations below were also dispersed, since they were the branches of those degrees. It is written: “The Creator dispersed them from that place,” the Creator carried out judgment in their upper roots, and the branches followed. If people collectively choose the wrong path and unite their worst qualities, they can achieve temporary success, since any kind of unity leads to the nullification of one’s ego for the sake of others. This is one way to implement spiritual properties because it is a step towards unity, towards bestowal among each other for the sake of the collective egoism. Even though this unity is done in order to harm anyone who is “outside” – the Creator, nevertheless the act of unity itself brings them partial success. We have witnessed the experiments of trying to build socialism in Russia and in Israeli kibbutzim. Why didn’t they succeed if the ideas behind them were so good? It was because they were doing “good things” as a means to build their “unified, egoistic tower, reaching to heaven, but against the Creator.” The goal was still “against” someone, instead of a complete destruction of egoism in order to attain the properties of bestowal and love. It was merely a partial unity among members of a group, or among all the people against the Creator. This is why the full scale of the ego, which is in need of correction, was not discovered initially; only a part of it was known. That’s what led to the idea that we can cope with everything on our own, without the Creator. However, it soon became clear that their ego was bigger than they thought and so they continued to forcefully “correct” it until their civilization collapsed. Our time is the time of individual egoism. Even two egoists are unable to form a natural unity, a family, not to mention any other types of union. Everything simply disintegrates. We see that no matter how much we want to unite various countries and diverse groups of people, or to have them act together in order to do good in the world, all our attempts fail. And they will continue to fail. The Zohar gives us advance warning about this, telling us that when we start our spiritual journey we have to establish the right goal: to attain similar properties with the Creator in order to unite with Him. If, from the very beginning, our goal is to build then it’s no surprise that our unity will only hurt us and we will not succeed. We have already seen examples of this in our world. Let’s hope that we don’t repeat the mistakes of the past, like the “wise men” who meet at international conferences such as the “G20 summits” and the climate summit, aiming to bring prosperity to the world. They won’t succeed. The only question is: how many towers will they have to build and see ruined before they understand the reason for their failures? If we don’t pursue the right goal, then any attempt at unity in our world will fail and bring more harm. Will The Kremlin Become The Next Tower Of Babel? Why did the Creator disperse the builders of the Tower of Babel? After all, they wanted to unite and build a city for themselves, so why did this result in an explosion of enmity between them? The answer is that this had to be revealed. Even though they were able to unite, their unity could only endure for a short while because they weren’t connected to the goal, to their next degree. They took advantage of their present degree for all it was worth, just like Soviet Russia, which garnered its share of success for a period of history. It even began competing with America, but then the collapse began. Why did it happen? It’s because they had used up all the opportunities of their degree, and then they had nowhere to go. The next step would have been to ascend upward, out of their state of forced unification and onto the next degree – unification by thought and by choice. But they did not have the strength or the means to do this. They had no way to compensate for the mature ego, the egoistic development within that system. As people grow, the motivations of the past are no longer enough. They no longer face the evil that once forced them to unite in times of sorrow. This is why a new phase sets in and all of the past unity comes crumbling down. This is the same thing as what once transpired in ancient Babylon. There is no future for Russia other than to attain immediate correction by utilizing the method of correction. This country is especially able to attain the goal, and it can do so faster than any other nation if only its people would adopt the goal and method of Kabbalah as their national idea. If that were to happen, then over the course of a single generation they would succeed in building a spiritual and material empire! Theoretically, this opportunity is available to them. Otherwise, we will witness a complete collapse and disintegration of the Russian Tower of Babel. Can Science Really Say Anything About The Universe A Billion Years Ago? A question I received: Everything that the science of Kabbalah says about perception of reality and the Creator’s concealment and revelation seems very subjective. It says that everything depends on me and I just have to change my attitude in order to feel a different reality. So where is the reliability, objectivity, and independence of my research? All of this seems very subjective, and it changes along with me. My Answer: It’s indeed unpleasant to feel that one’s existence is unstable and subjective, the way we perceive the world in our sensations and mind. However, this is, in fact, true and it obliges us to attain the true, eternal foundation. Initially we are in a world where everything is subjective. We used to think that the world existed on its own, independent of whether there were people on our planet. We thought that even before the terrestrial globe was formed (let’s say five billion years ago), our universe had already existed and had been developing for 10 million years. But who told us this information? It was a human being. When he did tell us this? Today. But how can someone tell us about what happened in the past? It seems this way to him in his senses because they divide all sensations in a specific way and identify them according to time. In my senses I evaluate a specific sensation as “time,” I call one sensation “a billion years” and another one “a second,” and place other perceived actions into this sensation. This is how multidimensional pictures of time, space, movement, and changes are formed inside me by various sensations. All of this happens in my senses. The concepts of time, space, and other changes (or movements) are within me; everything is within me. But what is outside of me? This is something I don’t know; I don’t even know whether anything exists outside of me at all. This is because I can only feel what is inside of me. It is impossible for us to feel anything unless it enters our senses. All of the space that we feel as being outside of us also exists inside. Otherwise, how would we feel it? Kabbalah separates my Sefirot of perception into inner and outer Sefirot. In the inner Sefirot I feel myself, and in the outer Sefirot I feel the outside world. However, all of the Sefirot are mine and they exist inside me. In the process of correction, they all unite and become inner Sefirot. I then become composite, unified and singular, standing opposite the Creator who is also singular. When you look at your computer screen, you cannot see anything that hasn’t entered it yet. If you perceive any information on the computer – for example, if you read text, watch a video, or listen to music – all of this must already be inside the computer. This example helps us to see why it is forbidden for us to say that our world already existed 15 billion years ago, unless we take into account that this is only so relative to our perceptions. All of science is true; we merely have to add a small note on the bottom: “relative to the human senses.” Everything is true, just in regard to me. This is why in the science of Kabbalah, the Creator is called “Bo-Reh,” which means “Come and See.” If you reveal Him inside of you, attain Him and “see” Him (because vision is the most explicit perception out of our senses), then the Creator exists for you. However, if you have not attained Him, revealed Him, and felt Him, then He does not exist for you. If you say that you simply heard about Him, then this is not even an abstract form; it is a fantasy that your “instructors” filled you with. After all, the abstract form is when you have felt a phenomenon, and you imagine it afterwards without it being clothed into matter. The single concealment is the reverse side of the Creator. This is a connection with Him, but a negative one. A person’s vision is clouded by everything: he has problems with his family, children and wife, with his boss at work, his bank balance, and his health. However, he always attributes everything taking place to the Creator and understands that this is simply the Creator’s way of playing with him. If he doesn’t forget that everything comes from the Creator and does not lose this connection, he is already in the state of single concealment, the reverse side of the Creator. This state contains various sublevels, which depend on how one understands the reason for why the Creator is doing all of this. Perhaps it’s because He wants to punish the person for the mistakes he made in the past? On the other hand, a person may know that there is no such thing as punishment. Or, he might decide that the Creator has always treated him well, even in the past; or he breaks all of his ties to the past and focuses entirely on the future. In other words, he feels that the Creator sends him suffering in order to help him advance in the future. The Creator pressures him similar to how parents pressure their child because they want him to succeed. Once a person reaches this realization, he begins to justify the Creator – either with regard to the past or the future, with the latter approach being more correct. However, the problems may be so great that a person becomes confused completely. He comes to the bank, or home, or work, and everywhere he encounters so many challenges that he forgets about the Creator and remains alone with his problems. His excuse for this is that he must first put his life in order. It’s true – you really do have to work on your problems, but at the same time, you shouldn’t forget that they come from the Creator. You have to do everything that is expected of you in this world, but with the intention that you will attain the Creator’s revelation through these actions. The Creator uses all of these situations to reveal His opposite side to you. So the right way for you to see the situation is to correct the problems in the bank, with your family, and with your health, but to do it for the sake of revealing the Creator (“His face”), instead of thinking that the most important thing is to get rid of the problems themselves. If you worry only about how to fix your bank account, your family problems and your health, then nothing will help, and even greater problems will come. But if you do all of this for the sake of revealing the Creator, or in other words – with a different intention, then everything will work out – even your bank balance. The reverse side of the Creator becomes revealed to us through all of these situations in order for us to find the right attitude to Him and to reveal His face. This revelation will elevate us above all the problems. In our time the chaos of Babel has consumed the entire world and the world is ready to ascend. The Creator deliberately broke the common soul in order to show it the separation between its pieces and to direct them toward correction. It is not the reality that changes, but my perception of reality and my attitude toward it. Which Path Will You Choose – Abraham’s Or Nimrod’s? We will rise to the heavens and will fight the Creator so that He doesn’t flood the world as he did in the beginning of time. A person gradually learns and begins to understand that he has to strive towards bestowal, but he doesn’t want to stay “in the Land of Israel” where everything is done for the sake of bestowal, since he can’t see the benefit in doing so. As new egoistic desires are revealed within him, he leaves the Land of Israel and moves towards Babylon, the land of reception. He then starts to think that the wisdom of Kabbalah can be used for egoistic purposes, for personal fulfillment. He wants to conquer the Creator and make Him serve his own egoistic purposes rather than the other way around, just like in the Grimm fairy tale about the fisherman and his wife. He starts to look for a lower, less noticeable place where he can hide from the Upper Force in order to avoid getting rid of his egoism. Thus, he builds a “city and tower” (ZON de Klipa) and lives in it. He thinks that the Creator has to fill his egoistic desires with Light, instead of fulfilling his clean desires, since the latter would require him to ascend and attain the property of bestowal, Bina. He wants his egoism to be fulfilled and argues with the Creator. This is what is referred to as “building a city (Zeir Anpin of Klipa) and a Tower of Babel (Malchut of Klipa), which happens to us on every level. Each time, we have to make a choice of whether to follow the path of Abraham – the path of bestowal, or the path that the whole world chooses – the path of Nimrod. There is a rule: “The whole is equal to any of its parts.” The whole Torah is present even in our smallest and lowest states, including the states called Noah, Babylon, Egyptian slavery, wandering in the desert, construction and destruction of the Temple, and the entire path until the end of correction. It repeats itself again and again on each level. This is why when studying The Zohar I can find everything I read within myself, in every state I go through: an Egyptian slave, the people of Israel, the High Priest of the Temple, the Pharaoh, Bilam and his donkey, and so on. They are all inside me. Our role is to try to imagine and sense these metaphors like a child that’s studying the world around him. The most important thing is to not stop making an effort. There is no other book in the world and no other way to lift ourselves into spirituality. The desired is what we will discover in the future, in ourcorrected qualities. In that world we will be united with the environment and the Creator. We learn that there exists another reality where everything is perceived inside us and nothing is perceived outside of us. However, all of this is still unreal for us for now. It’s possible that everything we imagine as the picture of the future is actually nothing like it. We don’t realize just how much our life will change. It’s not that our world will not change in some way; rather, a completely new world will emerge. Therefore, when we read The Book of Zohar, we have to tear away from everything that is familiar to us and try to immerse ourselves in this book, as if going inside it. When we read The Book of Zohar and we am in it, then we really live within it. For now we cannot exist in two worlds simultaneously. For the time being, we are able to be only in one. Therefore, we tune out of this material reality and try to build another picture, like a child who wants to be grown-up. The child wants to be an adult in all aspects, such as in the clothing he wears, the way he acts, and the way others see him. He wants everyone to treat him like an adult. In the same manner we need to imagine in all our senses and in all our fantasies that The Zohar is talking about our new world, in which we are situated. In other words, it is talking about our inner qualities in which we exist and in which we see a new reality. This “game” brings about the influence of the Light that Reforms, and then that new world is revealed. It is not that a new world is revealed and the old one disappears, and we fly off into the sky. Rather, we reveal that we are living in desires; namely, two desires – ours and the Creator’s, which become revealed one against the other inside us. We feel them and exist between them as the middle line, which is our “I.” There is nothing except this; we exist between two forces. A question I received: If a person has a serious illness, is bankrupt, and is having problems with his marriage, will all of this be fixed as soon as he enters the spiritual world? After all, we learn that all of this suffering is given to a person in order for him to correct himself. Otherwise, how would he ever be able to say that the Creator is Good and does Good? My Answer: If the Creator is revealed to you, then you will say that He is Good and does Good. For example think of the tremendous suffering that Rabbi Akiva had to endure during his agonizing death, yet he still blessed the Creator. This is not a legend about a martyr, but a true state which each of us can experience – to suffer yet not feel the suffering. “The Creator is revealed” means that I reveal the quality of bestowal in myself, above the egoistic desires. Along with all of my suffering, I am immersed in an ocean of goodness. Otherwise, how can I bless the Creator? Our egoistic desires will never be fulfilled. The first restriction (Tzimtzum Alef) will never be annulled. We can only receive fulfillment inside different desires – the Kelim of bestowal which we build above our desire to enjoy. Question cont’d: But in these Kelim, will I feel full or hungry? My Answer: You will feel full, like a guest that receives pleasure from the fact that the Host is receiving pleasure from you. But are you receiving pleasure? No! That “you” which you are asking about today, the egoistic you, will never receive pleasure! Another “you” – the corrected you, the one that receives pleasure from the Host’s enjoyment, will receive pleasure. But that egoist that just wanted to eat won’t receive anything! Question cont’d: So will I be full or not? My Answer: Yes, you will be! My Answer: By building new types of desires inside you and thereby becoming 613 times fuller! However, this pleasure won’t be felt in your former desires. This is something we don’t understand yet. It constitutes the difference between being in this world and in the world to come. However, this will come. The Book of Zohar describes only our inner qualities; this is why Kabbalah is called the inner part of the Torah. It only seems to us that the world develops and expands outward, but this is not true. It is our egoism that causes us to feel a spatial dispersion. This outward perception is opposite to the correct focus and to the spiritual root. After all, the root is a thin line (Kav Dak), which passes through all of reality at its deepest level. Therefore, we have to concentrate within, focusing on our desires and qualities. We will then reveal a more internal degree. In the science of Kabbalah we learn that our whole ascent lies in continually shifting to a more internal Partzuf. 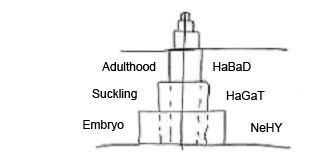 First the conception (Ibur – embryo) in the Partzuf NeHY occurs; then the inner Partzuf HaGaT is built inside, which is the suckling stage (Yenika). Then an even more internal Partzuf of HaBaD is built – the stage of adulthood (Mochin). Thus, we complete one Partzuf – one of 125 degrees to complete correction. What now? Now a new Partzuf begins, which is a new degree of correction, like the next, higher floor, and it also consists of the same three stages – conception (or embryo), suckling, and adulthood. In this manner, we constantly delve deeper and deeper until we reach the line of Infinity and suckle from this line. This is why one’s search should always be directed inside. As we study The Zohar, we should concentrate only on the inner picture where everything connects together. We have to dive inside and not think about anything that remains outside. We should be completely immersed in this book, as if we have entered a wonderland and are travelling around it, wishing to see and learn everything that is there. We hear voices, see different colors, and we don’t understand what is going on here, who affects us and how. We have entered a world of our desires and qualities, and we are wandering between them. For example, it’s like those movies where the camera penetrates inside a person’s body and travels around the blood vessels, showing everything that is taking place from within. Similarly, we penetrate within ourselves and become surrounded by our desires. We enter a world that consists of our own qualities and desires, as well as Lights, Kelim and screens, which we have to imagine. We can imagine them as if we exist inside them and they surround us all around. Or we can imagine that they are inside us and we are always digging inside them trying to understand them better. We can imagine it in different ways, but the most important thing is not to tie it to our ordinary reality of today. However, later we will discover that this reality is also felt inside us.